RAW HOLLYWOOD : SAVE THE WORLD: CELEBRITIES UNITE FOR MARVIN GAYE REMAKE OF "WHAT'S GOING ON"
SAVE THE WORLD: CELEBRITIES UNITE FOR MARVIN GAYE REMAKE OF "WHAT'S GOING ON"
Their has been so much negative things going on in the world today that are leaving many people scared of not knowing what will happen next. With the senseless killings, police brutality, hate crimes & the recent attack at Pulse nightclub in Orlando the world is crying out for help. 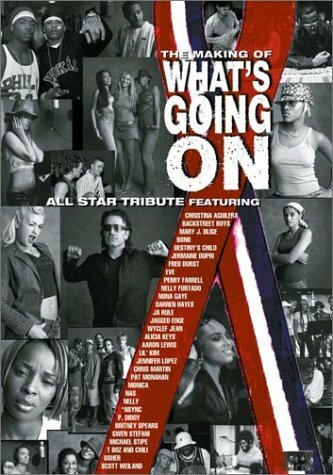 In October of 2001, some of the music industries popular artists banded together to record an All Star Tribute of Marvin Gaye's memorable hit "What's Going On". The track featured Britney Spears, The Backstreet Boys, Mary J. Blige, Diddy, Destiny's Child, Jermaine Dupri, Fred Durst, Eve, Gwen Stefani, Nelly Furtado, Nona Gaye, Darren Hayes, Wyclef Jean, Christina Aguilera, Alicia Keys, Aaron Lewis, Jennifer Lopez, Nas, Ja-Rule, Nelly, N'SYNC, Lil' Kim, Usher & Michael Stipe. The remake was constructed to bring a global awareness to the AIDS epidemic, but it is still very relevant to many of the current world issues that we've been faced with for many decades. The biggest message of the song is that we all must love one another, respect & treat everyone equally. The world is in a very sensitive place & I can only wonder, when will be learn to love each more? We all speak about uniting when horrific things happen, but when will be actually do it? It's sad that so much hate is in the world simply over many misunderstandings. It is very crucial for us all to learn that we are so much stronger when we stand together.